The Adirondack Park was created in 1892 and established as "Forever Wild" in 1894, but that doesn't mean the 6 million acres of land have always been free from controversy surrounding their use. One of the most serious threats to the Park's wildlife and waterways came in the 1940s in the form of a series of battles that would come to be known as The Black River Dam War. The technical beginning of The Black River Dam War was the passage of the Burd Amendment in 1913. This piece of legislation allowed for 3% of the Forest Preserve's 6 million acres (180,000 acres) to be flooded to facilitate the creation of reservoirs, although its consequences didn't appear fully for three more decades. 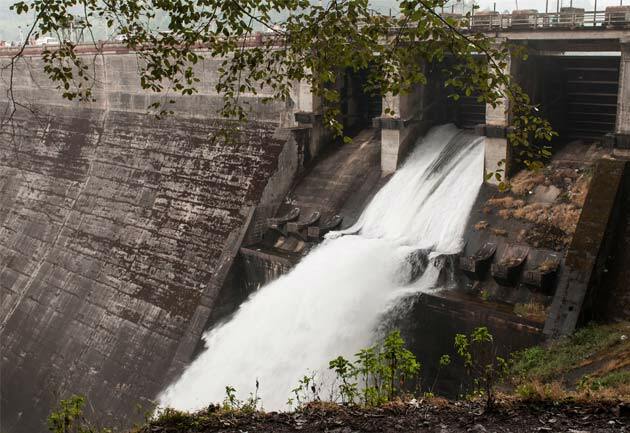 The Machold Storage Law followed two years after the Burd Amendment and stated that anyone could create a river regulating district, subject to approval by the Conservation Department. Once approved, the district could build dams, construct reservoirs, and alter or regulate river flow. Two such districts were formed under the Machold Storage Law in the early 20th century: the Black River Regulating District in 1919 and the Hudson River Regulating District in 1922. The Hudson River Regulating District's Conklingville Dam project was approved that same year, and the Sacandaga Reservoir (now known as Great Sacandaga Lake) was subsequently created in 1930. The dam and reservoir proposals of the Black River Regulating District, though, would encounter much greater resistance from environmentalists. In 1920, the Black River Regulating District received approval on its plan to construct 12 hydroelectric dams and accompanying reservoirs on Forest Preserve Lands. Of the 12, three already existed, seven were dropped, and the remaining two became the subject of intense controversy. These two proposed dams would both be located on the southern portion of the Moose River, a tributary that feeds into the Black River. One was to be constructed at Higley Mountain, and the other at Panther Mountain, and the two together would flood the Moose River Plains. The Moose River Plains, however, is the largest winter deer-yarding ground in the Adirondack Park, and flooding it would've had a significantly negative impact on deer populations and sporting. The project also would've eliminated six ponds and substantial portions of the Red and Indian Rivers and smaller streams. While the Adirondack League Club (ALC) opposed the Panther Mountain dam (which would've flooded the Club's land), few people or groups voiced their concerns about the Higley Mountain dam, and the project was approved in 1945. In 1945, Paul Schaefer and other conservation leaders learned of the proposed Higley Mountain dam, and to their shock and displeasure discovered that the necessary paperwork had already been signed. The land that would be flooded as part of the project unfortunately fell within the 3% that was allowed by the Burd Amendment, and state officials told the conservationists that nothing could be done. Not willing to accept this answer, Schaefer and his colleagues began an anti-dam campaign and created the Adirondack Moose River Committee. They created printed materials, reached out to environmental and sporting groups, and gathered as much support as possible against the Higley Mountain Dam project, ultimately growing their committee to include more than one thousand local and national organizations. Two years later, the Adirondack Moose River Committee earned a monumental victory as Governor Thomas Dewey changed his mind and opposed the dam project. Unfortunately, though, the relief would prove to be short-lived. Just two weeks after the victory by Schaefer and company, Governor Dewey turned against the conservationists once again when he announced that he was now in support of the Panther Mountain dam project, which was to be even larger and more devestating than the one at Higley Mountain. As it turns out, Dewey had struck a deal with the dam builders, and effectively agreed to exchange his approval of the Higley project for that of the Panther project. Once again, those in opposition to the construction of the dam voiced their opinions, with hundreds of organizations - including the U.S. Fish and Wildlife Service - siding against the project. In 1949, the State Supreme Court heard the case, and ultimately declared the Panther Mountain project to be unconstitutional. It was eventually discovered that more than thirty other reservoirs had been planned throughout the Adirondack Park. To prevent such projects from being carried out in the future, additional legislation was put in place. In 1950, Governor Dewey signed the Stokes Act that would prevent the building of reservoirs in Herkimer and Hamilton Counties on the Moose River's South Branch for any reason other than municipal water supply. The following year, the Ostrander Amendment was introduced in order to permanently reverse the Burd Amendment and outlaw the building of river-regulating reservoirs on Forest Preserve land. Voters passed the Ostrander Amendment in 1953. Even with the addition of the Stokes Act and the Ostrander Amendment, dam supporters still managed to introduce an amendment in 1954 to allow the Panther Mountain dam project to continue. Although it successfully passed through two successive legislatures, it was ultimately defeated by voters in 1956, bringing the Black River Dam War to its final end. Schneider, Paul. "The Adirondacks: A History of America's First Wilderness."